A: Call The Doctor provides after hours doctor home visits for the general public of Hobart and Adelaide when your own GP is not available. We are a bulk billed service, provided patients have a Medicare or Veterans Affairs card. Call The Doctor employs experienced medical practitioners to provide Best Practice after hours care for patients in the comfort of their own home. We are available after hours for when you are unexpectedly sick and your regular GP is unavailable. Many of our doctors are fellows of the Royal Australian College of General Practitioners (RACGP) or the Australian College of Rural and Remote Medicine (ACRRM), or are currently studying towards achieving these goals. We provide a full range of services including advice, starter medications, prescriptions and medical certificates. We are not an emergency service, if you have an emergency, please call 000 immediately. Q. How much will it cost me if I have a Medicare card/ DVA card AND a concession card, health care card or pension card? A: The service is bulk billed to your Medicare card or Department of Veteran Affairs card, meaning no out of pocket expense to you. Patients will be informed of this at point of call. Q. How much will it cost me if I am under 16 years of age and have a Medicare card/ DVA card AND concession card, health care card or pension card? A: The service is bulk billed to your Medicare card or Department of Veteran Affairs card or you are under 16 years of age, meaning no out of pocket expense to you. Patients will be informed of this at point of call. Q. How much will it cost me if I have a Medicare / DVA card but DO NOT have concession card, health care card or pension card? A: The service will charge a $49.98 GAP at the time of consult. Patients will be informed of this at point of call. Call The Doctor will have EFTPOS facilities for payment. Q. Is the $49.98 GAP for patients that DO NOT have concession card, health care card or pension card claimable with Medicare? A: The $49.98 GAP is not claimable with Medicare. Patients will be informed of this at point of call. 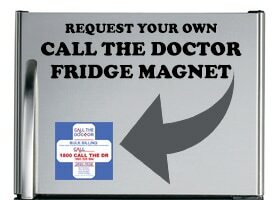 Call The Doctor will have EFTPOS facilities for payment. Q. If there are multiple patients in a house hold of whom DO NOT have concession will we have to pay the GAP for each patient? A: The $49.98 GAP is payable once per house hold, per day. If there are multiple patients then the others will be bulk billed. Patients will be informed of this at point of call. Call The Doctor will have EFTPOS facilities for payment. Q. How much will it cost me if I DO NOT have a Medicare card/ DVA card? A: If you do not have a Medicare Card or Department of Veterans Affairs card then there is a $300 fee. International tourists/students can claim the consult fee on travel insurance. The service is bulk billed if you have a Medicare card or Department of Veteran Affairs card, Patients will be informed of this at point of call. 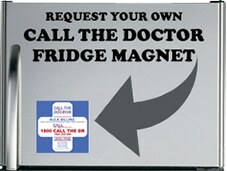 Call The Doctor will have EFTPOS facilities and accept cash for payment. Q. How much will it cost me if I am a tourist from overseas without Medicare or DVA? A: If you do not have a Medicare Card or Department of Veterans Affairs card then there is a $200 fee. International tourists/students can claim the consult fee on travel insurance. The service is bulk billed if you have a Medicare card or Department of Veteran Affairs card, Patients will be informed of this at point of call. Call The Doctor will have EFTPOS facilities for payment. Q. What if I don’t have a Medicare card or Department of Veterans Affairs (DVA) card on me at the time? A: If you do not have a Medicare card or DVA card, but are eligible for it, you need to call Medicare (open 24 hours a day) on 13 20 11 to obtain your Medicare card number. The doctor will then be able to attend to you with no charge. If you are not eligible then there is a $300 consult fee. Call The Doctor will have EFTPOS facilities for payment. Our service does not operate during regular daytime hours. Q. When can I book a doctor to come out to my house? On Sundays and public holidays we take bookings 24 hours a day. A: You will need your name, date of birth, address, contact number, Medicare number, presenting condition / problem. Q. Can I make a booking for more than one person? A: Yes. We will need the name, date of birth and Medicare number for each person. Q. How long does it take for a Doctor to see me? A: We aim to see all patients within 3 hours, however we can usually attend to you in a much shorter time than this. There are times in peak periods where the call numbers are unpredictably high and in these rare circumstances wait times may be longer. You will be advised if the doctor will be late. Q. What if I have a disability? A: We will see people with disabilities. We have telephone access services to help people with disabilities. Q. What if I have a language barrier? A: We have over the phone translating and interpreting services available. Q. Can I book a doctor for tomorrow or next week? A: No, we will not take bookings beyond the day you are calling. If you would like to book a consult for the future you will need to ring on that day or make an appointment with your regular General Practitioner. Q. Can I see the doctor more than once in a day? A: Yes, providing that your condition worsens or a new condition is present. A: Yes, our doctors can write you a prescription at the doctors’ discretion and the presentation is urgent. Our doctor will assess you and supply you with the prescription as deemed necessary. We also carry many commonly used medications that can be offered to you as a starter pack should you not be able to get to the pharmacy straight away. Q. What if I can’t get to a chemist/pharmacy? A: Our doctors carry commonly used medications and wound dressings that may be dispensed to patients free of charge. Q. Are the Doctors well qualified and competent? A: Doctors working for Call The Doctor are registered with Australian Health Practitioners Regulatory Agency (AHPRA), and go through regular training and professional development programs. Their placement is assessed and approved by the Department of Health before they are employed with our service. The Board of Directors includes senior doctors within the Royal Australian College of General Practitioners (RACGP) Fellowship who have over 30 years experience in medical practice. Our doctors are supervised by medical directors who provide expert medical advice, ensuring quality control and best patient care. Our medical directors also carry out regular clinical audits and provide ongoing clinical supervision to all of our doctors. Q. What if my regular GP is not registered with Call The Doctor? A: We do not require your regular GP to register with us for you to use our service. However, please discuss with them your needs to see a Doctor after hours from time to time and ask if they are available. If they are not then ask them to sign up with Call The Doctor. On the day following your consult, we will send a detailed report to your regular GP for continuity of care. Q. Can Call The Doctor provide comprehensive primary care to my family at home? A: Our service does not replace your regular daytime GP. Our home visiting doctors provide appropriate medical care when needed after hours when your daytime GP is not available. Our doctors are also equipped to treat a range of common ailments. Q. How much will it cost me if I have a Medicare card/ DVA card and book between midnight and 8am? A: Most likely it will be bulk billed, however, there may be a $200 call out fee for consults between the hours of midnight and 8am. Patients will be informed of this at point of call. Q. Will I be contacted by Call The Doctor or its affiliates? A: Please note that by using the service you agree to be opted in and may receive a patient survey and the opportunity to write a review of the service. This is for accreditation and practice improvement purposes.